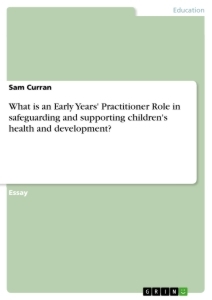 What is an Early Years' Practitioner Role in safeguarding and supporting children's health and development? What is an Early Years Practitioners’ Role in safeguarding and supporting children’s health and development? Children are a valuable resource, in a plethora of ways. One could see them rather crudely as being just useful for the economy: in that they can be relied upon to fill positions and jobs which have been left by those who have retired and become dependent on their younger counterparts. However, this viewpoint seemingly demeans the wider use of children, one which is acknowledged by Unicef (2012) in their authoritative document stipulating The Rights of the Child, as they list a total of 54 articles which refer to the rights of children, including how adults and governments can collaborate to ensure that they are safely provided for. The document proceeds to emanate a series of things which must be in place for children to fulfil their potential and become responsible citizens who make a positive contribution to society. Alluding to the holistic movement of education which is seemingly so prevalent in modern times, the article converses of the commodities/provisions which children should have access to: ranging from basic rudimentary articles such as food and shelter, to things which are deeper in nature: i.e. to be stimulated in all the right ways and to receive correct nurturing and support which will facilitate their well-being to the optimum level. In line with eminent psychological theory often cited in education, a child needs to have access to fundamental needs like sustenance and a fixed abode before they can reach a state of well-being, and perhaps even the feted level of self-actualisation, where they are at one with themselves (Maslow, 1970). 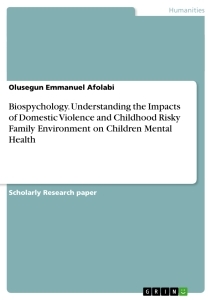 This influences the importance of securing a child’s well-being due to their fragility and importance for the future. This assignment will specifically focus on what exactly an EYP can do to support a child’s development, whilst assessing how public policy has been implemented to safeguard the rights of a child, with a particular focus on how all children can be catered for. The term ‘well-being’ is commonly used in literature pertaining to children and is quite a wide ranging concept. It is hard to pinpoint a singular definition of the concept, but there seems to be an assertion that a child’s well-being is arguably affected by their health and development. The ‘health’ of a child refers not just too physical levels of well-being and being free of ailments and afflictions, it also refers to their emotional wellbeing and how psychologically healthy they are. Public policies and governments by the UK government seem to be mindful of this fact: the DCSF (2008a) recognise and appreciate the wide-ranging dimensions of a child’s development, mentioning the word ‘holistic’ on ample occasions, which signifies the increasing importance of this educational paradigm and the wider acknowledgement of what children need. Consequently, there have been increased public reforms to cater for this and the role of an Early Years’ Practitioner (EYP) (formally defined by the DfE, 2014 to be those whom work with children of 5 years or younger) has expanded and come under more scrutiny. Often, there can be vast discrepancies in the level of a child’s wellbeing, which are predominantly known as ‘inequalities’. Inequalities have long been something which the government, agencies and those involved in the care of children have sought to address. Building a brief empirical history of the matter, arguably the Every Child Matters (DfES, 2004) document sparked a considerable shift in matters with a more specific set of guidelines on what a child should have access to (they listed 5 main aims), regardless of their gender, background or circumstances. This is arguably similar to the aforementioned Unicef document, in aiming to reduce inequalities, although it may not be conceivable to completely eradicate them. Various other curriculum reforms have mirrored this, particularly with regards to income deprivation, which is still an issue in the UK. Field (2010) speaks movingly of the adverse conditions which some children have to inhabit and the effects this can have on their ‘life chances’, particularly with regards to educational attainment and also the amount of money they can earn. Both are arguably key factors in determining a child’s chance of achieving success in their life. 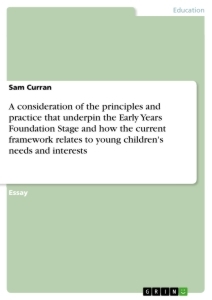 This report, which Field and a team of other dignitaries composed, made 2 ‘overarching’ recommendations: to establish a set of lifestyle indicators to identify children who are in most need of help and also the proposal of a new ‘Foundation Stage’, which is what led to the inauguration of the Early Years Foundation Stage (EYFS). 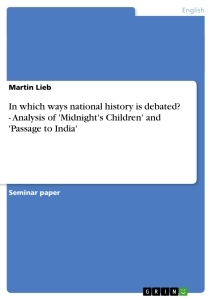 Interestingly, Winter (2010), a leading writer in the area of social work, was somewhat sceptical about the Government’s sudden interest in the education of pre-school children, noting that they had rarely focused on such an area in the past. Winter (2010) went on to question how this would be implemented, noting that when the Foundation Stage was conceptualised (2010) this was a period of transition and turbulence for social workers and all parties (such as EYPs) who were involved in the care of pre-school children. Despite her reservations about the implementation of the policies, Winter ultimately concluded that this period of ‘assimilation’ would be for the greater good and result in more informed care of young children. The above discussion seems to refer to two principal aspects which affect how such policies are implemented and their ultimate success: whether they were universally adopted across the country and the responsiveness of such institutions to implementing them. The Government dealt with the first matter by making institutions abide by a strict set of standards in the EYFS framework (2014) and ensuring that they were subject to a ‘regulatory’ regime, being inspected on a regular basis (DfE, 2013a). However, the enforced approach of such standards could potentially perceive to be counter-productive and curtail workers’ motivation if they feel that they are restricted in their roles and cannot demonstrate their own personal qualities. To surmount this barrier, Winter (2010) suggests that those working with children demonstrate ‘reflexive practice’. This is a stance taken which allows a practitioner to thoughtfully consider the content of such documents and agenda by the government and select the aspects which are most relevant to their institution (or the ‘spin’ from the ‘fact’ as Winter coins it), or indeed the group of children they are working with. This is a notion which could also be applied to an EYP’s personal practice, critically appraising and improving their personal practice, something which Schon (1983) wholeheartedly advocates that all those who work in education should be doing. However, it may be too simplistic to suggest that if one is reflective, then success is guaranteed: although if practitioners are more vigilant in their practice, then this can be useful, such as recognising and addressing inequalities for example. They can also be helped in this area by the breadth of documents and guidance which are currently in place in the literature. All EYPs are required to complete an Early Years Profile of each child prior to them making the transition from pre-schooling to a formal level of schooling (DfE, 2014). As the EYPs are now extensive and cover a large range of the child’s attributes (learning style, cognitive abilities and personality), this does allow for inequalities and other such issues to be addressed more effectively (DfE, 2014). Although it is irrefutable that EYPs must possess a certain level of academic proficiency to undertake their duties successfully, in ensuring a child’s health and wellbeing, their emotional intelligence may be more useful than their cognitive faculties. In general terms, this assertion is reaffirmed: Goleman (1996) voiced a similar opinion, in that emotional intelligence affects success in life more than pure academic acumen. Taking a more profound outlook on matters, if the EYP (or key worker) possesses a high level of emotional intelligence, then this will allow them to benefit the children twofold. Firstly, in ensuring that children are well looked after, but also by transferring this emotional intelligence to the children as is their responsibility to model correct behaviours and attitudes to the young people under their care (DfE, 2013b). Furthermore, if Goleman’s (1996) earlier point is believed to be valid, this will naturally allow the children to experience a greater quality of life and increase their health and development.